Daniel Salzman’s second Manhattan Beach “green home” features a water-efficient all California-native plant garden, recycled concrete paved walkway and roof solar panels that provide over 6.2 kilowatts of energy per hour, cutting the electric bill in half. A green home doesn’t have to feel cold, sterile and ultramodern. Manhattan Beach builder Daniel Salzman, owner of Evergreen Design Build Inc., specializes in the construction of green houses that feel homey and inviting. Salzman’s second “green home” – a sprawling 7,758 sq. ft. house on 9th Street in Manhattan – is made from 100 percent recycled and reclaimed materials without sacrificing the warmth of a cozy beach home. Smooth, white kitchen countertops are made of recycled granite, floors of quarried lava rock, and ceiling moldings of reconstituted wood chips. A built-in composter turns leftover food cuttings into fresh soil for the organic garden out back. Recessed LED lighting uses less than half the energy of fluorescent bulbs. The six-bedroom, 6-1/2 bathroom, tri-level home was the first in Manhattan Beach to be rated gold-certified by the U.S. Green Building Council’s LEED certification program, according to Salzman. The large square footage kept it from getting the top-rated platinum-certification. The home sold last month for roughly $6.5 million. Most homes are loaded with contaminants from formaldehyde-based insulation, fiberglass, dirt and chemicals commonly used in construction, according to Salzman. “The average home has dirtier air on the inside than on the outside,” he said. The wide-plank, American walnut floor was installed with glues and sealers certified to contain no harmful chemicals. The wood used for the floor was certified by the Forest Stewardship Council, ensuring that no deforestation occurred while it was harvested. Recycled denim cotton, which contains no formaldehyde or fiberglass, was used as wall insulation, along with double-insulated, hard ducting to avoid the loss of heat. A spiral staircase spans three levels, along with a natural cooling tower that reduces the need for electricity. The 8-inch plank American walnut floor was installed with glues and sealers that don’t contain harmful chemicals. A stunning, spiral staircase and a 40-foot air shaft connect the three levels. A digital button opens two skylights that sit atop the shaft, creating a system that draws cooler air from the basement to the warmer top levels. The skylights, along with large and numerous windows, reduce energy costs by minimizing the need for lighting. Recessed, ultra-efficient LED bulbs installed throughout the house last 20 years, contain no mercury and use eight percent the energy used by incandescent bulbs. The master bathroom floor is made of recycled glass mosaic tiles and can be set on a timer to heat up. The bathroom features two low-flush toilets and recycled granite countertops. A spacious shower and tub both drain to the irrigation system outside. Salzman landscaped the yard with California native plants for their low water needs. A sensor on the home’s exterior shuts off sprinklers when it rains. The lawn is watered by a 500-gallon, underground water tank that is filled with filtered gray water diverted from bathroom sink and laundry drains. The system is exempt from Manhattan Beach’s ordinance allowing watering no more than twice a week. 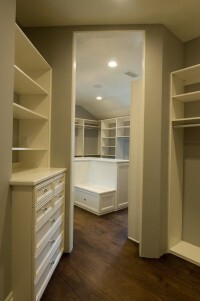 Every woman’s dream: His and hers adjoining walk-in closets. Custom paneling and woodwork is finished with water-based, non-toxic paints. Building supply companies are carrying more green materials as consumers begin to demand more environmentally-friendly products. Evergreen Design Build Inc. only uses suppliers who carry materials made from at least 30 percent recycled products, according to Salzman. Salzman said that a green home doesn’t have to break the bank. His next project will be a lower end home in Manhattan’s tree section. By introducing green building technologies to consumers, Salzman hopes to encourage larger builders to change their practices and processes. Every man’s dream: a home theater with an HD projector and a 139 in. screen. The tile behind the lighted candy case is made of recycled glass and silver. The box office-like carpet is made from recycled water bottles. A throwback refrigerator and microwave add to the retro vibe. “We can convert people by exposing them to the healthier aspects of green building,” he said. Salzman is a firm believer that no matter how green the house is, it still must feel like a home.